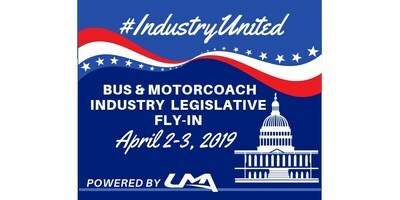 WASHINGTON, April 1, 2019 /PRNewswire/ -- The United Motorcoach Association and 20 partner organizations will be in the nation's capital on Wednesday, April 3, to advocate for maintaining the partial fuel tax exemption for motorcoaches and to educate members of Congress on the vital role private motorcoaches play in creating jobs, generating tourism dollars, and a providing safe, fuel efficient, and green solution to transportation and travel. "With a new Congress in place, and new leadership in the House, the Bus & Motorcoach Industry Legislative Fly-In is an opportunity for bus and motorcoach operators to ensure that their priorities are known," said Stacy Tetschner, President & CEO of UMA. "Meeting face-to-face in group settings, operators can share important facts and statistics that show the industry's contribution to the economy and its status as the safest mode of transportation. And most important, they can tell their individual stories of local job creation and how regulations affect small businesses. Eighty-one percent of private bus and motorcoach operators nationwide own between one and nine coaches and each coach directly provides about 3.5 jobs. Motorcoach businesses are small businesses that contribute to local economies." The United Motorcoach Association is the nation's largest organization exclusively protecting and promoting the interests and welfare of privately-owned bus and motorcoach companies. Members include motorcoach owners and industry suppliers. For more information about UMA, upcoming events, membership, and important legislative information, please visit www.uma.org.